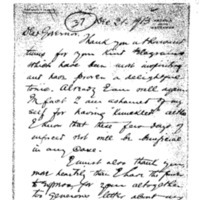 William G. McAdoo writes to Woodrow Wilson thanking him for his support on the currency bill and inviting him to stay at Arcadia in Georgetown, South Carolina on his way back to Washington. Thank you a thousand times for your kind telegrams; which have been most inspiriting and have proven a delightful tonic. Already I am well again. In fact I am ashamed of myself for having knuckled altho I know that these few days of enforced rest will be beneficial in any case. I must also thank you, more heartily than I have the power to express, for your altogether too generous letter about my work for on the Currency Bill. The truth is that had it not been for your own mindful personality and leadership and hold upon the Confidence of the people, my efforts would have counted for nothing. So it comes back to you after all. I can only tell you of the joy it has given me to serve under and with you and of my constant hope that I may be useful to you in the truly wonderful work you are doing for the country. I read in the papers that you were thinking of changing quarters on account of the unfavorable weather and lack of privacy at Pass Christian and while I did not credit it altogether, I thought it worth while to tell you of this charming place where you will find the perfection of what you want. I have never visited a more charming and ideal spot. It is a real Arcadia. So if you want to break your return journe, and spend a week here, Capt. Emerson says that he will be very happy to turn the place over to you. It is only 15 hours from Washington. I am leaving Saturday Jany 13. Conditions in the country are much improved. I believe that we have the situation in hand again and that with wise management, a year of great prosperity is ahead of us. McAdoo, W. G. (William Gibbs), 1863-1941, “William Gibbs McAdoo to Woodrow Wilson,” 1913 December 31, WWP18257, First Year Wilson Papers, Woodrow Wilson Presidential Library & Museum, Staunton, Virginia.